Events/Seminars - Welcome to Lamppost Farm! Seminars/Events at Lamppost Farm are designed to give participants hands-on experiences-- opportunities to draw near. This could include all sorts of farm-life activities: hand-milking cows, feeding chickens, harvesting vegetables and herbs from the garden, making sauerkraut or salsa, pressing cider, refinishing furniture, maintaining a compost pile, etc. Events can be pre-arranged and cost is to be determined. Your corporate group will have a unique experience as well! 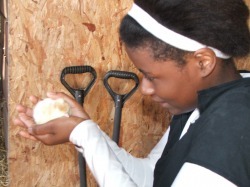 At Lamppost Farm we offer hands-on educational experiences that build relationships with consequence. These experiences lead participants to a deeper Exploration, Discovery, and Understanding. "In schools, we create artificial learning environments for our children that they know to be contrived and undeserving of their full attention and engagement. Without the opportunity to learn through the hands, the world remains abstract, and distant, and the passions for learning will not be engaged." - Shop Class As Soulcraft, by Matthew Crawford.